Ultraseal International has expanded its presence in China in response to increased demand from the automotive sector for its recycling porosity sealant Rexeal 100™ and associated equipment. The company has doubled the size of its operation in Shanghai, where it has run a jobshop since 2005, and opened a second jobshop and office at Chongqing, one of the most important automotive hubs in the country. Many new jobs have been created at Chongqing where Ultraseal is working closely with major Tier 1 automotive suppliers to provide them with a reliable and permanent solution to the problem of porosity in cast metal parts. Porosity – microscopic pores that form during the casting process itself – can cause parts to leak under pressure and Ultraseal is a global leader in solutions to porosity. It designs and manufactures casting impregnation equipment and porosity sealants. Demand for its recycling technology is high in China and is growing. OEMs and Tier 1 suppliers have adopted Rexeal 100 as it is now considered the World’s benchmark recycling porosity sealant. Stephen Hynes, Marketing Director of Ultraseal International, said: “Our new venture in Chongqing is very exciting. China is the largest automotive producer in the world and Chongqing is one of its fastest-growing automotive hubs. “There is great demand for our recycling sealant technology in China where many companies are forward-looking: casting impregnation using recycling sealants requires less water, less chemicals and produces less waste-water than a conventional process. “Our technology is popular because Ultraseal has many global OEM approvals and offers consistent chemistry and standards of support worldwide to customers who use its casting impregnation technology. “However, we recognise that some companies do not want to run their own casting impregnation process in-house, so Ultraseal Chongqing (UCQ) provides sub-contract casting impregnation services. “Alternatively, Ultraseal can convert customers’ existing casting impregnation systems to use Ultraseal’s recycling sealants, including Rexeal 100™, so that they can benefit from recycling technology. “Conversions of machines are becoming popular in China as more companies in the automotive supply chain turn to our recycling technology. All of Ultraseal’s porosity sealants, including Rexeal 100™ are manufactured at the company’s base in Coventry, UK, where its Research and Development are carried out, and exported to over 40 countries around the world. Demand for impregnation recycling technology has also risen in Shanghai. 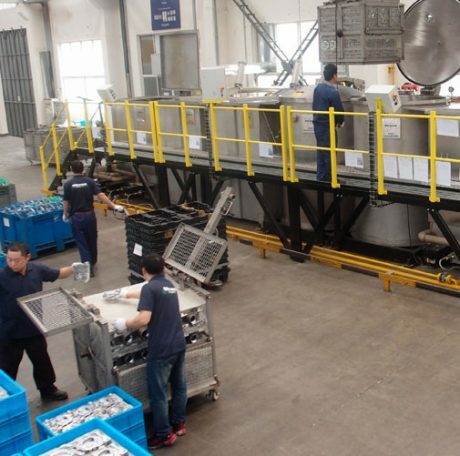 Ultraseal has doubled the size of its original jobshop in China and moved it to new premises in the heartland of Shanghai’s automotive centre where it is closer to customers. A new casting impregnation machine, with far greater capacity than the previous machine, has been installed. Ultraseal has been a pioneer of casting impregnation for decades. The company has a worldwide presence, with JVs in India and China, operations in the United States and Germany and an office in Japan, and a network of 22 agents/distributors worldwide, along with a network of jobshops and associated jobshops.